There are many things that affect whether or not a certain hairstyle suits you. Your face shape is one. How you style it is another. If you’re considering a top knot, whether you’re actually a practising samurai warrior should be a third. But the main one is the hair itself. The genetic makeup of your locks determines what you can do with it and how obedient it is when styling. And while some men (terribly annoying sorts) have a full, shiny mop that could rival Samson’s locks, others have to work hard to keep their follicles looking semi-presentable and semi-present. If you want to do your crowning glory justice, then you need to get personal and give your hair the bespoke treatment. That’s why we’ve tapped the advice of industry experts to find out what you can do with your hair type, no matter what your mama gave you. Thick hair is the poisoned chalice of hair types. Superficially, it’s something to be envied, with no hint of male pattern baldness. What the haters fail to understand, though, is that with great body comes great responsibility not to look like you’ve placed on the podium at Crufts. Managing thick hair is all about maintenance. If you’ve got a lot of mop up top, you’ll need to hot foot it to the chop shop on a regular basis. The good news is that you’ve got plenty of options for haircuts. In short (or not) if you’ve been graced with a thick thatch, you’re able to master a man bun, bask in a halo of shaggy layers or rock a slick pompadour. Make the most of it. Getting thick hair to damn well behave itself is tricky because a few things are going on that are looking to scupper your success. “Thick hair is clearly heavy, so if you require lift (a quiff for instance) then apply mousse or gel to the root area and blow dry. If a sleeker style is desired, apply the product to damp hair so the product holds shape without expanding,” Robinson says. 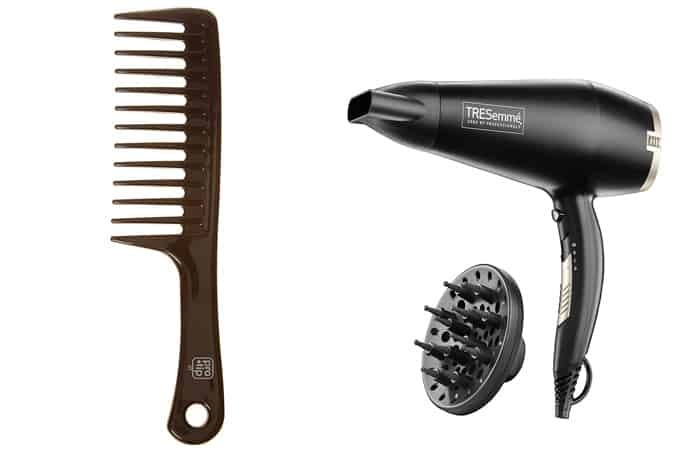 Thick hair is also extremely reactive to the tools you’re using too, so brush with extreme caution. “Style thick hair into shape using a wide-tooth comb after the product has been applied, then use a dryer with a diffuser attachment to dry the hair to about 70 per cent, allowing slightly damp hair to air dry,” says Robinson. So, if you’ve got fine tooth combs or bristle brushes in your hair care kit, get rid, right now. If you have south or east Asian genes, you’re likely in possession of the two most valued qualities in a barnet. “Asian hair is usually shiny and is most often thick,” says Aveda creative director Michael Lendon. There’s a catch though, which you probably already knew. “It can be more challenging for this hair type to retain styles put in place by heated tools without additional hair products. Also, as the hair matures it can become thinner quicker and increasingly prone to breakage,” adds Lendon. Turns out you can’t have everything after all. Because of this hair type’s density, vertical feats of hairstyling are trickier to master, so for ease, it’s best to work with gravity rather than against it. “Sharp geometric shapes suit Asian hair as they will hang well with little-to-no styling. A short crop is also a striking look that suits this hair type,” says Lendon. Try a short back and sides with length on top for minimal maintenance, or consider a longer fringe that can be swept behind the ears if you’re after more length. You’ll need to switch up your approach to styling though, depending on which look you plump for. “For shorter Asian hair, dry the style with a good quality hair dryer and use a metal barrelled round brush to add body and bounce. For longer Asian hairstyles, try applying heat with tongs or straightening irons to add shine and shape,” says Lendon. Fine hair is pretty hard to make the best of because it feels like there’s not much to work with. Unfortunately, you won’t get even a fraction of the sympathy that those with diminishing locks do. You’ve still got a full head of hair, it’s just a bit more shy and retiring than other types. “Fine hair lacks volume and density, is limp and often you can see the scalp,” says hair stylist Joseph Lanzante, owner of Manchester barbershop The Men’s Room. Your problem is that you’re not dense enough, which in this case is not a good thing. “Men with fine hair should leave it longish to add weight as short hairstyles will ultimately look like they’re lacking body,” says Lanzante. Sounds counterintuitive, but we’re siding with the experts on this one. In practice, ‘longish’ hair is considered ear-to-shoulder length, so layered millennial curtains or a mid-length swept back style are both great options to minimise the tyranny of lifeless locks. With fine hair, turning straw into gold is entirely possible thanks to the innovations of modern hair tech. Nice one, science. “The aim with fine hair is to add volume, and this is best achieved with a blow-dry lotion for volume, finished with a dry powder for density,” says Lanzante. Avoid heavy, greasy grooming products like the plague, though: if it looks like it will weigh your hair down, it’s not your friend. Don’t douse your head in all that powder and hope something will stick; you need a bit of technique here. “Men with fine hair should use a vent brush and a hair dryer, drying upside down to add body to the final style,” adds Lanzante. Just watch out for headrush. Wavy hair is a bit of a fence sitter, not able to make up its mind on whether it’s curly or straight, leaving those with this hair type utterly confused as to what the hell to do with it. Add to this the fact that all waves are different and you’ve got yourself a pretty changeable barnet, says celebrity hairstylist Oliver J. Woods. Leave wavy hair to its own devices and it ends up looking a bit of a mess, like you’re an extra in Game of Thrones. It needs purpose and direction. “The best way to style wavy hair is to go short on the back and sides and longer on top to give the hair some movement and shape,” says Woods. With that in mind, make messy crops or short, textured quiffs your go-to. You’ll need to mess things up to kill off #basicbarnet vibes. “A good product to use on wavy hair is a sea salt spray to give texture, followed by a clay to finish off and hold in shape,” adds Woods. Afro hair is a misleadingly catch-all term for a hair type which – although similar in ways – differs massively from one person to the next. That said, similarities do exist. “Textured hair has curls which can be tight coils or looser waves, varying in thickness,” says Lendon. Those with wavy curl patterns can go for a blunt fringe and a fade on the sides, but if you’ve got tighter coils, try a short but squared cut on top for a modern take on classic nineties styles. Mavericks are good in certain vocations (fighter pilots, homicide detectives) but one place you don’t want to find one is your hair follicles. Refusing to be put in a box, unruly hair is hard to manage as it doesn’t usually lay flat or straight and has a rough cuticle layer, says Ruffians barber Stevie Warwicker. “Unruly hair will typically need some sort of styling aspect to keep it looking presentable.” There is a silver lining, though, as unruly hair has plenty of texture, which is beneficial to its overall finished appearance – so your glass is kinda half full. Ish. Think shaggy face-framing mops or a textured short, back and sides. If it feels middling, it’s not the one for you, son. Like an out of control teenager, unruly hair needs a bit of discipline to get it on the straight (or curly) and narrow again. “Cream- and oil-based products help put moisture back in while also reducing frizz and flyaway hair, which is common for those with this hair type,” says Warwicker. “A hairdryer and a vent brush will help to control unruly hair by smoothing the cuticle, allowing the hair to lay flat while minimising messiness.” Consider your follicles told. When you’re working with such temperamental tresses, we get that it’s tempting to throw in the towel and reach for the hair clippers, but don’t be so hasty. So if your hair is packing its things but not yet out the door, ask your barber for a medium-length blunt chop and coax it to stay a while. If things have advanced, try a short French crop or buzz cut instead of succumbing to baldness prematurely. If you’re losing your hair, you need to be extra tactical about persuading ambivalent hairs to stick around. “Avoid product build-up at the scalp as this can impact hair growth and thinning,” says Lendon. “Cleanse the scalp and gently exfoliate regularly.” This also means going easy on heavy, greasy products and choosing lighter formulations that are water-based and easy to get rid of. Before you reach for the growth pills, try a few tricks of the trade too, says Lendon. “The best styling method for thinning hair is to use a hair dryer on a high heat as well as drying the hair upside down to create more volume at the root.” It’s got to be better than a five-figure transplant.